Aram is a Registered Maine Guide and Wilderness First Responder with an MA in Religious Studies from Chicago Theological Seminary. Prior to moving to Maine in 2015 he worked as a minister for children (and the child-like) at a progressive faith congregation in Claremont, CA. He worked as an advocate and shelter coordinator for LGBTQ identified homeless youth in Chicago, IL. He worked as an aid to elementary school educators of students with special needs in Indianapolis, IN. He backpacked across Scotland, walked a pilgrimage in Spain, practiced yoga in Costa Rica and has guided wilderness trips and urban walks of various durations for people of many ages, genders, and dispositions in 11 different states and a couple of Canadian provinces. Now Aram spends his days as the Executive Director of Renewal in the Wilderness devising ways to bring the wisdom of wilderness and regular rhythms of renewal into the lives of care providers, justice workers, and faith leaders. Anne Finkle has been hiking, walking and canicrossing (canine cross country running) her way around the woods of Maine since she was very young and is an amateur naturalist, cook and gardener with an interest in wildlife and native plants of Maine. Anne holds a B.A. 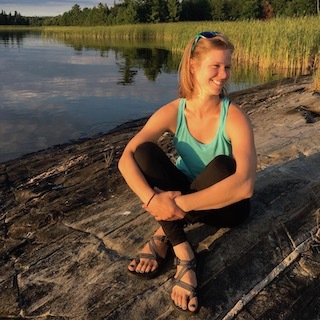 in French Language and Literature from University of Southern Maine and will be using her broad knowledge of nature and ecology literature to lead Beauty Walks with Renewal in the Wilderness. She currently works in the Greater Portland area and spends her free time advocating for and volunteering with wildlife and youth education programs in Maine. She is an avid dog lover and aims to inspire others to create connections with themselves and with their dogs through nature. Anne would rarely be seen out in the woods without her adventure-loving Coonhound, Bea! Lizzie is a yoga instructor, urban/regional planner, and a big fan of nature. She led backpacking and hiking trips for the Appalachian Mountain Club in the mid-Atlantic and Northeast, has taken Wilderness First Aid, and is attempting to visit all 52 National Parks. Her favorite thus far has been Denali, where she bushwhacked and backpacked, closely followed by canoe camping in Voyageurs. Lizzie is originally from Michigan, where she developed a deep love of water - Great Lakes, Great Times! She also enjoys practicing and learning about meditation, primarily at the Cambridge Insight Meditation Center in Cambridge, MA, where she lives. Lauren is a Registered Maine Guide and a Certified Yoga Teacher. Whether she is guiding an outdoor adventure or teaching yoga she believes in providing safe spaces, having fun and feeling good. Her teaching and guiding methods are rooted in trauma stewardship and she teaches for Greener Postures Yoga and for the non-profit organization Sea Change Yoga. Lauren is a huge advocate for taking naps and her spiritual guides are her two dogs, Maya and Dillard and her cat Kali Ma. While travel to far out places has always been a passion, Lauren is happy to have found a home in Maine. She is working on her M.A. in Culture Studies and figuring out how to grow to an all-season garden in southern Maine. Her sun sign is Libra and her moon sign is Gemini. Her search for balance is never dull. Fritz has been introducing beginning backpackers to the rhythms of walking and the art of noticing in places like Dolly Sods Wilderness and southern Indiana since 2015. He was born in rural northwest Indiana to open skies and land where he traced deer trails through cornfields, black oak savanna's, and over ancient sand dunes. It is in this place that he learned the parallels between the landscape and the soul. Currently, Fritz is an urban agriculture conservationist in Indiana where he works to improve food security and soil health. He is the founding member of The Gleaning Garden, a communal garden and food forest that grows and gives away food. 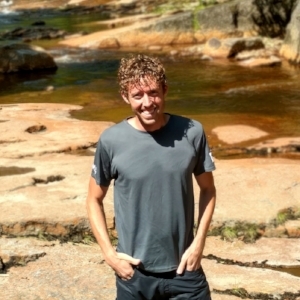 Formerly, Fritz was a landscape architect, a director of youth ministries, a trail crew member at Baxter State Park in Maine, and volunteer with the Green Mountain Club. He currently volunteers with Grace Unlimited at Butler University; an adventurous, all-inclusive, community of faith. Fritz is Wilderness First Aid certified and holds a B.A. in Geography and M.L.A. in Landscape Architecture focusing on landscape ecology. He runs and reads enough, believes in unity, is learning to embrace humility, loves the feeling of being socked-in above tree line, and has a cat named Texas. In River Rafting, CFS is the measurement of a rivers downstream flow in Cubic Feet per Second. Colin Frazier Simon (CFS! )...was born into a river rat family and was named by no accident. Since his youth water has always been in his blood and often between his ears. Whether surfing, free diving, rafting or fishing, his love of water has taken him to the many rivers along the Colorado Plateau, including The Old Man himself, the Colorado River. While the back country of Utah, Arizona, Idaho, Wyoming, Colorado, and New Mexico are the play ground of his youth, the Pacific Ocean of California Alta and Baja California stole his heart as a young man and he now lives in the place where the desert meets the sea. An avid fisher, rafter, packer, peak bagger, State Lifeguard, and child of nature, Colin aims to entertain and lighten his trail and river mates with a child-like glee that only the red and gold of the canyons at dusk can outshine. This guy loves the outdoors and will turn over every rock and scoop up every toad that hops across his path until you can't help but see a wild world under your every step and feel it pumping through your ever growing heart.